I took the photo of our front room from the angle of my chair. When I sit in that chair and turn slightly to the right, that’s what I see. I had said to myself, “It is enough.” I look over and see the broad sky and pretty bare trees outside and then look inside to take in the soft sunlight. I see the cats watching birds outside. I’m satisfied with the lot I’ve ended up with. There are many things the Admiral and I don’t have and will never have, but what we have is enough. It’s no small thing in this harsh and horrifyingly unjust world order to be able to sit in a well-lighted room one owns (and therefore controls), to feel and see lots of space and air, and sunlight through windows. The room is heated now but in summer can be air-conditioned. 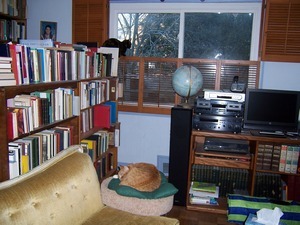 I have a choice of wonderful books; we’ve got NPR radio on, so we hear such lovely music. Two daughters in good health one living with us and another near by, both doing fine. I have whatever fame and respect I’m going to have that is meaningful. I won’t worry myself over what I write, just remember how much I am drawn to women’s books, serious works of literature no matter the gender, race, or ethnicity of the author, and how I’m spending my life among these and other rescued books.